Chicago Blues at its best!!! Adding to this CD's worth are the six pages of liner notes written by the noted music historian Billy Altman, which includes a wonderful story behind Juke, several nice photographs, and a complete discography of the contents. To quote from Mr. Altman "By 1968 he was gone, leaving behind a legacy that harmonica players everywhere regard as, quite simply, the holy grail." That much was recognized by the Blues Hall Of Fame in 1982 when they inducted him among the 20 honoured in their first year of existence. You'd think those pompous ciphers at the Rock & Roll Hall Of Fame would wake up and at least recognize him in their Early Influence category. 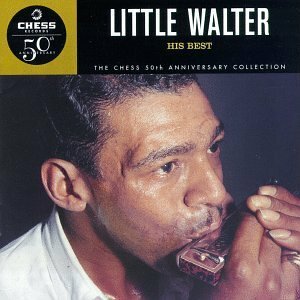 As one of the fathers of the postwar Chicago urban blues harmonica style, Little Walter remains one of the greatest players of that instrument. His classic "Juke" is an exciting instrumental that is the first "serious" showpiece for many emerging blues harpists. In fact, every leading blues harmonica player who followed Little Walter-and even most of his contemporaries-studied him closely, and can be heard playing his songs and licks. His playing influenced George Smith, Walter Horton, James Cotton, Charlie Musselwhite, Paul Butterfield, John Mayall, and many others too numerous to mention here. Walter Jacobs was also a fine blues singer, closely involved with the lyric, using a minimum of vocal ornamentation. He was not a "power" singer like Elmore James, but one whose vocal style embodied studied restraint. Walter sang all the typical blues motifs capably, from the down-and-out lovesick blues numbers ("Mean Old World") to the blues-shuffle storytelling songs ("Key to the Highway") to the uptempo, optimistic tunes ("Everything's Gonna Be Alright") that provide contrast to the sad blues themes. This is the real deal. The musicians on this recording grew up during hard times, many of them in the country in Mississippi; playing the blues was their outlet for expression and relaxation. No "arts funding" was needed for their learning.